I wish to add my voice to Queens Streets for All, an alliance within or near the DOT proposal of every school, church, business in the Woodside Sunnyside DOT corridor, and residents, totaling a group of over 12,000 and counting. We are extremely distressed that the mayor announced July 12 his move forward in August of 2018 to complete his DOT proposal, publicly opposed by our Community Board, Congressman, Councilman at one time, Assemblywoman, and majority of residents. Many of us are bicyclists, support protected bike lanes, and greater safety for pedestrians, motorists and cyclists. Protected lanes could be installed tomorrow with no loss of parking spaces. We invite the mayor to come here and speak to us, see the streets, and reconsider his proposal, going through it page by page, with representatives from our first responders. The narrowing and loss of a lane of traffic on the two streets, both one-way and only two-lane, would cause higher carbon emissions with congestion and parking searches. The drastic loss of parking 116 spaces is a hardship, with scarce space already and drivers circling for hours. The rate of car ownership here is half the Queens rate. The loss of more will cause harm to businesses, staffers, workers, over 2500 schoolchildren, and churchgoers. Protected lanes could be installed tomorrow with no loss of parking spaces. We have painted lanes which are supported. We have few alternatives. Mass transit is in "crisis" as described by the mayor, and adequate mass transit would be a prerequisite before removing street space, parking spaces, and lanes. Many of us cannot choose bicycles. The sacrifice and difficulty rests on our shoulders alone. The mayor is disrupting our ability to earn a living or operate, with no alternative or example by himself or his commissioners to, for instance, take public transit or a bike to work even one day a week. Even in 2017 his fleet was over 30,000, ten percent more than when he took office. Northern Blvd. 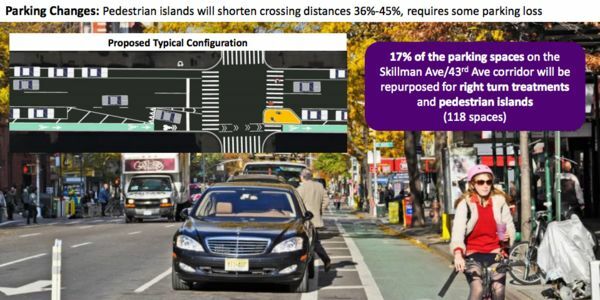 is a more direct through route for the "7+ mile Bike Highway from Forest Hills to midtown Manhattan." announced as the DOT goal. We support its selection for protected lanes, because all statistics point to it higher rate of accidents and deaths. The city is forcing a change on relatively safe streets, casting statistics in a way that portrays the streets as dangerous, in order to impose a sweeping change to decrease private car ownership without regard to the facts or the wishes and safety of a united community. The undersigned, and signers to written petitions. To receive instant alerts, email your name and telephone number. We will never use your private information for sales or share. This online petition is in addition to physical copies of the petition, already signed by 2500, with more coming in. The majority of the signatures come from those who dwell in 11377 and 11104. Thank you for signing the petition! You are helping mom & pops, workers and residents!! Tuesday, Dec. 19, 6-8PM, a public hearing is set at Sunnyside Community Services, 39th Ave., betw. Queens Blvd. & 43rd Ave.
A DOT representative confirmed that some in favor of proposal are coming from elsewhere in NYC, so if you want to make sure your local concerns are heard, please try to attend.